Whether you have a box truck, tractor trailer, or anything in-between, we have the equipment and experience to get you off the road and to the shop. There is no situation we can’t handle and no scenario we haven’t encountered in our 50+ years in the towing industry. When your heavy duty vehicle has broken down or been in a collision, trust the experts at Bob & Joe’s to handle the job quickly and carefully. No matter the size, we have the equipment to safely tow without causing any damage to the vehicle. We’re available 24/7 to get you off the road and into the body shop as soon as possible. If you have an attached trailer that needs delivery, we can handle that as well. We also offer heavy duty winching and recovering services. The team at Bob & Joe’s is often contracted by state and local police to help with vehicle recovery. Trucks stuck in creeks, ditches, embankments, and even pot holes — we’ve seen and recovered it all. 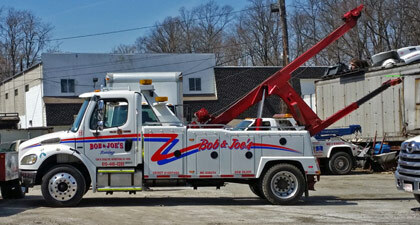 If you’re in need of heavy duty towing or vehicle recovery, don’t hesitate to call Bob & Joe’s! 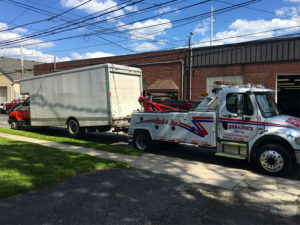 We service the entire tri-state region and our distance towing service will go anywhere in the country. Our most commonly serviced areas include Havertown 19083, Springfield 19064, Broomall 19008, Bryn Mawr 19010, Ardmore 19003, Drexel Hill 19026, Upper Darby 19082, Newtown Square 19073 and many other towns in the area.